Join us this Friday at Hares & Hyenas for the launch of The Telling Tree Story Book. The Telling Tree project, a City of Yarra initiative, celebrates the stories and artworks of local young people, culminating in a book about gender and sexuality. Over two workshops participants collaborated with TOP Studio Coordinator, Sean Smith, gaining an introduction to etching. Images produced now accompany personal writing and reflections on wellbeing within the publication. Presented by Yarra Youth Services, The Drum, Minus18 and The Ownership Project, we hope that the stories shared will be a moment in time, from which more stories may grow, evolve, and lead to other tales of greener pastures. With diverse backgrounds, including Colombian, Chilean, Ethiopian, Ghanaian and Gunditjmara, It Came From Over There presents a range of limited edition art prints exploring personal themes of cultural and spiritual identity. Etchings include a variety of inspirations including West African Adinkra symbols, illustrated Pentecostal bible excerpts and the deconstruction of memory. Artists: María Peña, Helen Sheferaw, Roxana Fuentes, Julius Bright Sackey, and Shakara Montalto. This exhibition was supported by the Victorian Government through Creative Victoria, and the City of Yarra. The My Culture exhibition of new etchings and woodblock prints by Artur Brata Laras, Chico dos Santos and Amos Wainggai opened on 21 August and runs until 12 September 2015 as part of the Craft Cubed Festival. The opening was joyous, warm and filled with many communities meeting. Artur made offerings to all ancestors, and sought blessings of harmony in the gathering. Chico sang to his ancestors in the gallery in keeping with cultural protocols. Amos called the warriors to action in a moving song. Ronny Kareni and the West Papuan community members who responded with singing and percussion were joined by Colombian musicians, with the opening flowing into the night by song, dance, food and conversation. My Culture was supported by the City of Yarra. The Young Artists' Residency exhibition, Etch This!, opened on 18 June and ran until 4 July 2015 as part of the Emerge Festival. 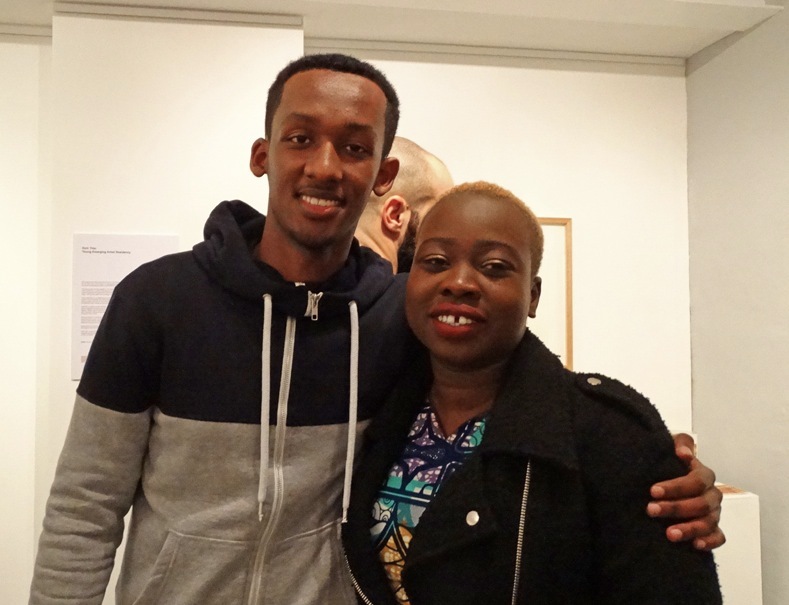 Here are a few highlights of the evening's celebration of the beautiful artistry by Guled Abdulwasi, Ayel Akot, and Souma Ahmadi who were mentored by printmakers Sean Smith and Minela Krupic. Etch This!, part of Emerge in Yarra, was produced by The Ownership Project in partnership with Multicultural Arts Victoria and supported by Creative Victoria, the City of Yarra and the Professional Pathways Scholarship of the Faculty of VCA and MCM, University of Melbourne. 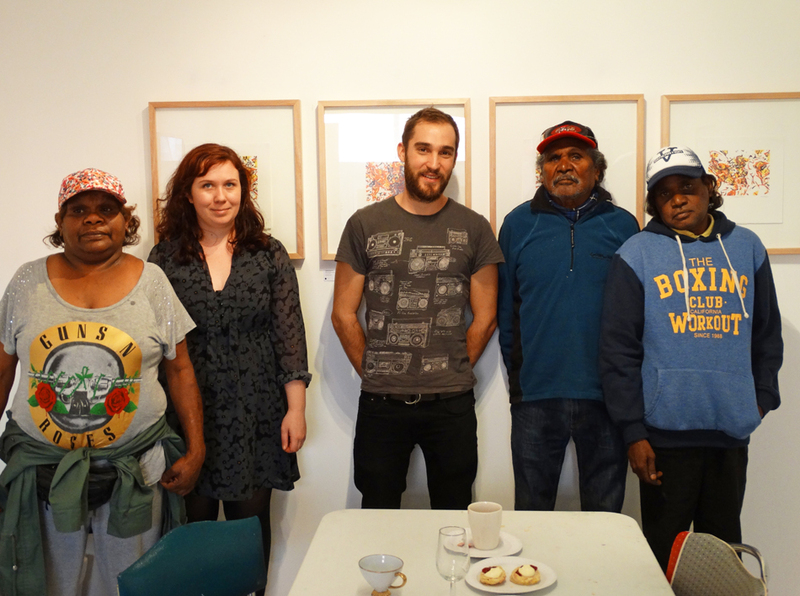 The Ownership Project artists and staff were treated to a visit by Iwantja Arts, South Australia. Artists David Frank, Eric Barney, Kaylene Whiskey, Rene Sundown, and art centre manager Beth Conway popped into the studio this Saturday for an afternoon of tea and scones. Two TOP artists got to meet the visiting artists and printmakers, sharing insights, stories and culture. Later in the afternoon the visiting artists made their way to David Frank's solo exhibition launch, Nganana Wararakatinyi Ngura (We Are Jumping) at Alcaston Gallery. David Frank's exhibition is current till the 6th of June. If you would like to know more about Frank's exhibition at Alcaston Gallery please click here. Iwantja Arts has a simultaneous exhibition titled Ngura Wangkanyi (Talking About Country) at PG Printmaker Gallery showcasing limited edition woodblock prints. Exploring the artists' powerful connection to country, these prints are the result of a collaboration between Iwantja artists and master printmaker, Basil Hall, and will be on display till the 12th June. The Ownership Project would like to congratulate both David Frank on his solo exhibition, Nganana Wararakatinyi Ngura (We Are Jumping), and all the artists part of Ngura Wangkanyi (Talking About Country). We very much look forward to seeing you all next time you are in Melbourne. Iwantja artists and art centre manager during our afternoon tea. 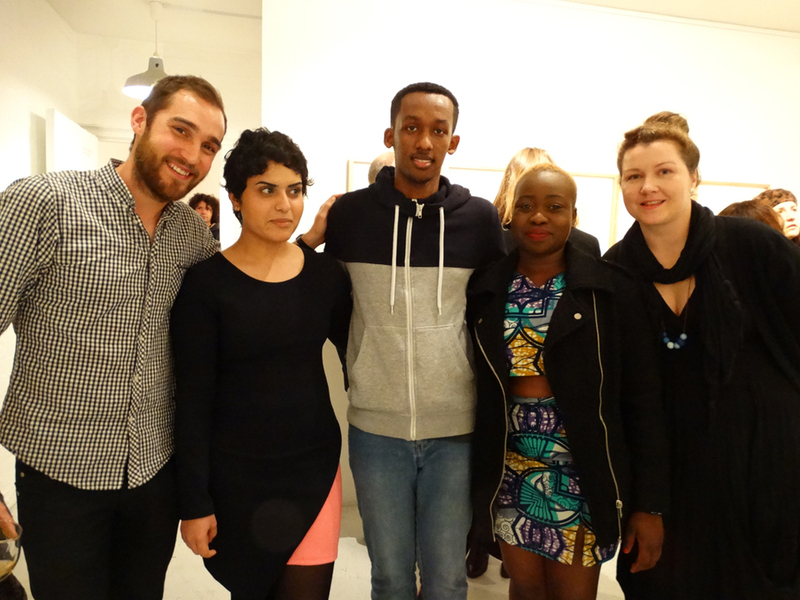 The Ownership Project has partnered with Multicultural Arts Victoria to offer a twelve week residency for three young emerging artists from East African and Iranian communities. We are seeking your help to fully realise this wonderful project. The three young artists are working with industry printmaking tutors on a series of new artworks that will culminate in an exhibition at The Ownership Project, titled Etch This, as part of the Emerge in Yarra Festival from 14 – 20 June 2015. The overall cost of the residency and associated exhibition is $5,000. This includes industry printmaking tutors, art materials, studio and gallery space, marketing and administration costs. The Ownership Project is seeking the final $2,000 to realise the project outcomes. To Support: If you would like to contribute to this project please visit our Australian Cultural Fund campaign by clicking here. All contributions are welcome. Crecimiento (Growth) will take the viewer on a metaphoric journey exploring growth and renewal that come from cross cultural navigations and the passage of time, delving into the artists spiritual ancestry, the first peoples of Chile. In Roxana Fuentesʼ first solo exhibition with The Ownership Project she explores the theme of personal growth and the cementing of power within self. Colourful and detailed prints and playful sculptures draw on the artistʼs own childhood, having spent much of her youth illustrating with pencils, pens and highlighters. As its fourth year comes to a close, the TOP Retrospective features a selection of handmade prints and installations by artists creating work in The Ownership Project’s Artists in Residence and Creative Capacity programs. The retrospective exhibition celebrates significant moments in this complex visual cultural narrative by East African, Ghanaian, Colombian, Chilean, Iranian, Timorese, West Papuan and Aboriginal communities here in Kulin Country. Come help us celebrate this comprehensive exhibition with good food, great company, and stunning artwork. 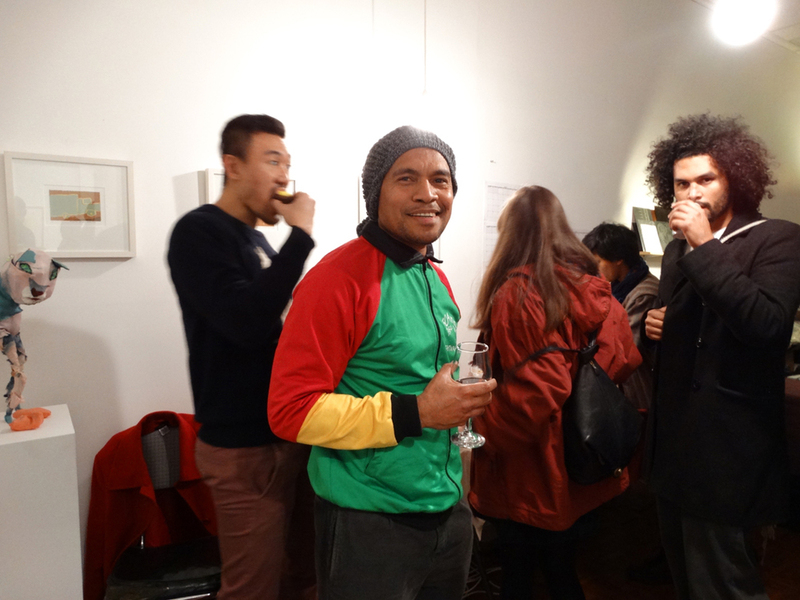 A preview to Iranian artist Hamed Rayat’s ongoing etching series, Boat People, was held on Saturday 13 December. "When I see my friends, those who are refugees and asylum seekers, they have had a difficult life, they have and still have a lot of problems. When I see them, I can see deep lines in their faces. They are different to other people- I can see their sadness, their anger. I wanted to show this." - Hamed Rayat. These portraits of the artist's friends show the physical and emotional toll on those forced to flee. These prints also serve as a self-representation of the refugee experience, something lacking in Australia's contemporary political and media landscape. Horn of Plenty is an exhibition of new prints by local East African artists, the culmination of two years of workshops. Industrious neighbourhood afternoons weave conversation with vibrant pattern work, encompassing daily rituals, henna work, seasonal harvests, and playful objects. Horn of Plenty is a satellite exhibition in the Craft Cubed Festival: The Art of Handmade, running 1-31 August 2014. In the trio of exhibitions it follows Harvest (2014) and Mothers and Ink (2013). This project is supported by the Victorian Government through Arts Victoria. Daddabile, relief print on Magnani paper by Nadia Y Sharit at The Ownership Project, 2013. The Ownership Project invites you to Harvest, a celebration of new prints by local East African artists. Industrious neighbourhood afternoons continue to weave conversation with vibrant pattern work, encompassing daily rituals, henna work, seasonal harvests, and playful objects. Adept at storytelling, the artists have individual sensibilities for texture, colour, and pattern. The works voice personal histories of movement and home, marking connections to place and to times past and to come. Join us to celebrate the works and connections made to date in the Arts Victoria-supported Mothers and Ink Project II, part of our Creative Capacity Program here in Kulin Country. The Ownership Project (TOP) is seeking three-four enthusiastic board members to compliment its current board. TOP is looking for individuals with an interest in the visual arts as well as a commitment to social cohesion for newly arrived, refugee, Aboriginal and Torres Strait Islander communities. TOP board members will be expected to contribute in a hands-on manner, assisting in their area of expertise. The organisation seeks individuals with knowledge in the visual arts/arts management, tax and accounting/MYOB, marketing and fundraising/philanthropy, as well as board governance. 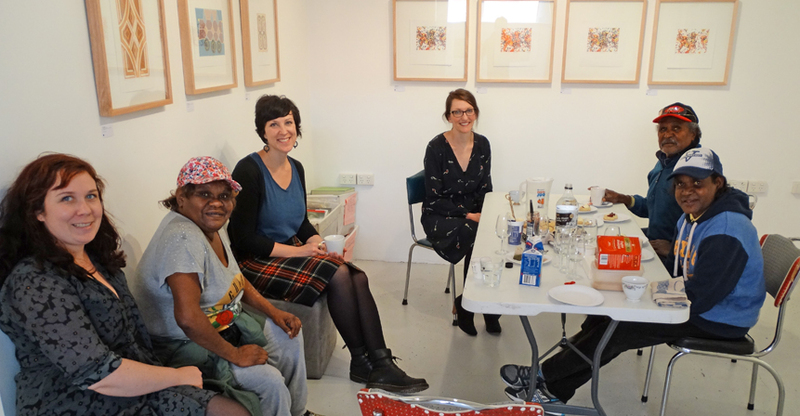 The Ownership Project is a non-profit studio and gallery promoting creative capacity and cultural expression of refugee, migrant, Aboriginal and Torres Strait Islander artists. The studio is the heart of TOP, a place of belonging, welcome and respect, where artists and printmakers create prints. The gallery hosts exhibitions from our community engagement projects, residence program and remote arts initiatives. TOP’s connections to art and design organisations link resident artists with further career progression opportunities. The Artists in Residence and Creative Capacity programs provide training in various printmedia under industry professional staff and an opportunity for participants to share their stories and aesthetics with the public. Artists are identified through various referral organisations working with newly arrived, refugee, Aboriginal and Torres Strait Islander communities. In your expression of interest, please include a brief CV and statement on how you have skills in one of the identified areas of need: tax and accounting/MYOB, visual arts/arts management, marketing and fundraising/philanthropy, and board governance. Alternatively, if you feel you can contribute in another meaningful way, please outline this in your application. An exhibition of new installation, etching, and relief works by Aboriginal artists Shakara Montalto (Gunditjmara) and Dennis Thorpe (Muruwari). 2013 has been an introduction to printmaking for these artists. The works created are brief excursions on the surface of the complexities of existence. The dynamics of symbolism, representation, drug use in society, cultural identity and sustainability are shifting. Bright pop colours, found objects and the power of language are icons across the spectrum of culture represented in this exhibition. Special thanks to City of Yarra for their ongoing support.